Losing weight is difficult, but there are natural and nutritious foods available to help overcome obstacles. Superfoods, foods low in calories yet dense in nutrients, can help fuel your body, fight hunger and cravings and support your successful weight loss. Superfoods are whole, natural foods in their raw and unprocessed state. Foods like wheat grass, spirulina and chlorella provide maximum health benefits by providing concentrated nutrients. Superfoods are a rich source of phytonutrients, including antioxidants, essential fatty acids, fiber, probiotics and vitamins. 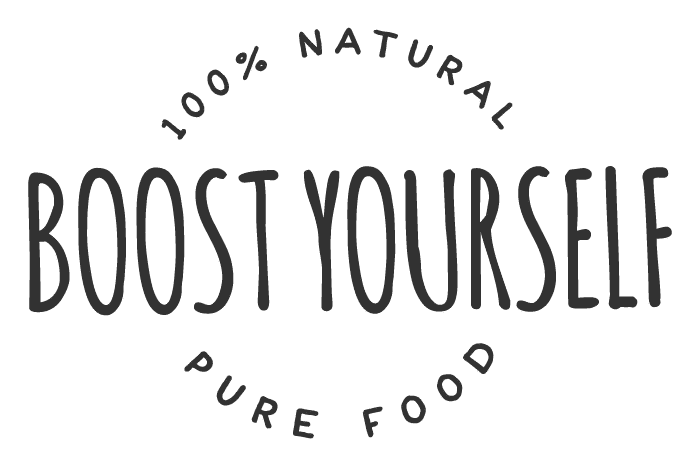 Replacing some of the high fat, high calorie, overly processed foods that you eat with healthy and naturally nutrient-dense superfoods is a great way to lose weight and feel great. Superfoods are natural, contain no man-made flavors, colors and additives, low in calories, contain no sugar and are perfect for weight loss. Many superfoods also help to speed up your metabolism, causing additional calorie and fat burn. Promotes healthy digestion through probiotics and digestive enzymes.  Healthy digestion allows your body to metabolize and absorb nutrients. Improves your body’s PH level and reduces the acidity of your body. Improves your immunity and reduces our susceptibility to colds. Flu and infection. 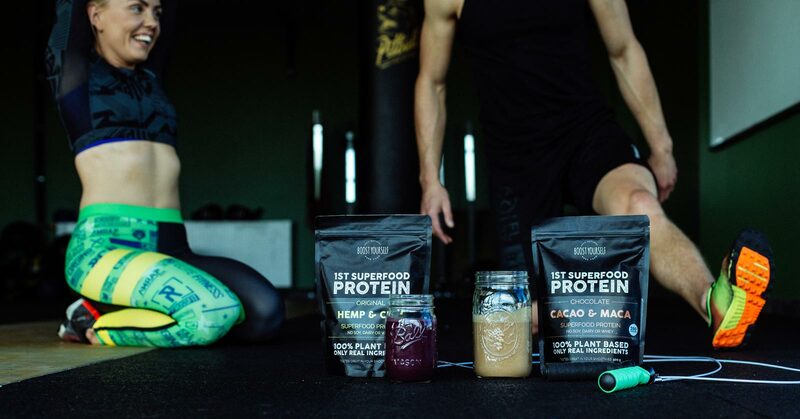 Superfood are easily blended and perfect for meal replacement smoothies. 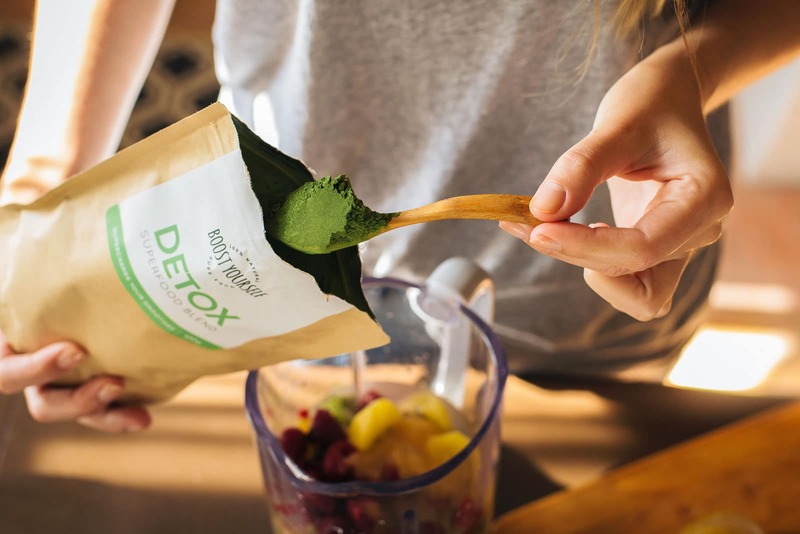 Detox Superfood Blend is 100% organic, contains no added sugar, additives or preservatives, is soy and lactose-free, and is recommended by nutritionists and trainers. Wheatgrass contains many minerals including zinc, manganese, copper, selenium, iron, magnesium, potassium, plus vitamins A, K, B and E. Wheatgrass is a highly concentrated source of nutrients which help your body cope with stress and are beneficial when you’re limiting your calories to lose weight. One ounce of wheatgrass is said to provide as many nutrients as two pounds of leafy greens. Barley grass contains chlorophyll and phytochemicals, multiple vitamins, fiber, minerals, amino acids and antioxidants. It contains 20 amino acids, including the essential amino acids not produced by your body. The major benefit of barley grass is as a source of insoluble fiber which will help you feel full sooner and for a longer time. Fiber is important for digestion, elimination, and weight loss. Chlorella is nutrient dense, contains protein, amino acids, vitamins A, C, E, thiamine, riboflavin, niacin, vitamin B6, and folate. It’s also is a rich source of chlorophyll, which balances your body’s ph-level and helps rid your body of toxins. Chlorella promotes hormone production, boosts your metabolism, improves your circulation and promotes higher levels of energy leading to reduced body weight and fat. Spirulina provides protein, essential fatty acids, vitamins B, C, E and chlorophyll. Spirulina will boost your energy level, strengthen your immune system, improve your digestive health, and decrease your appetite. The protein in spirulina is difficult to digest and requires more calories for the digestion process. As a bonus, spirulina contains 26 times more calcium than milk, to keep your bones and teeth strong. Camu-camu contains 40 times more vitamin C than an orange and contains high levels of ellagic acid, a flavonoid that has been shown to promote healthy levels of cortisol and insulin, both regulate blood sugar. Camu-camu also suppresses your appetite, removes harmful toxins and improving the level of lipids (fats) in your bloodstream. Losing weight is not about starving yourself. You need to eat healthy food in moderate quantities and for superfoods to be effective for weight loss, they need to be a part of your healthy diet. 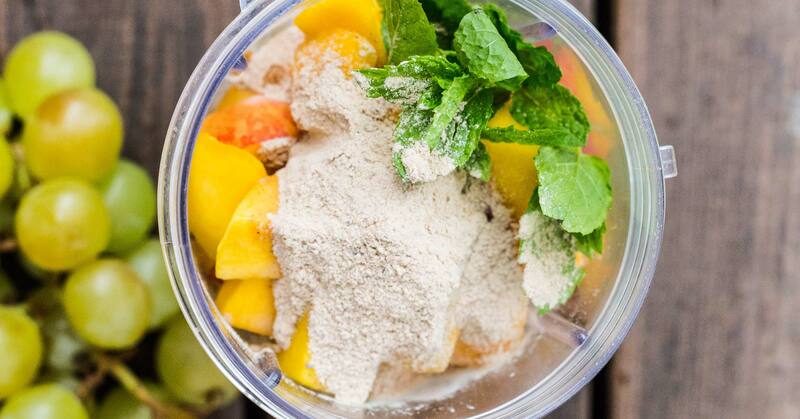 The simplest (and most effective) way to use Detox Superfood Blend is to add it to your fruit smoothies made with pineapple, mango, or blueberries. 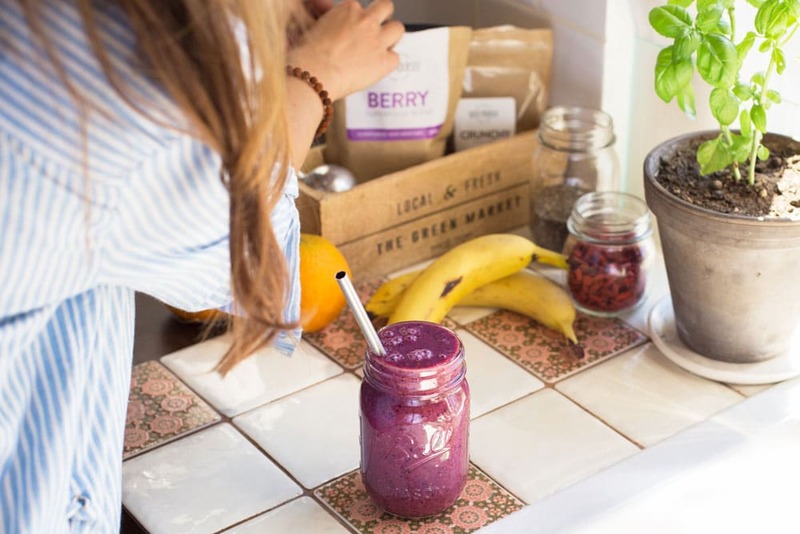 Combining fruit and Detox Superfood Blend in a smoothie creates a delicious, naturally sweet drink great at any time of day as a meal supplement or meal replacement. Blend 1 minute, garnish and enjoy. Are you ready to enjoy the benefits of superfoods and healthy weight loss? Ships worldwide and takes just 3-5 days by DHL Express.